Scientific name: Thlaspi perfoliatum L.
Synonym name: Microthlaspi perfoliatum (L.) F.K.Mey. 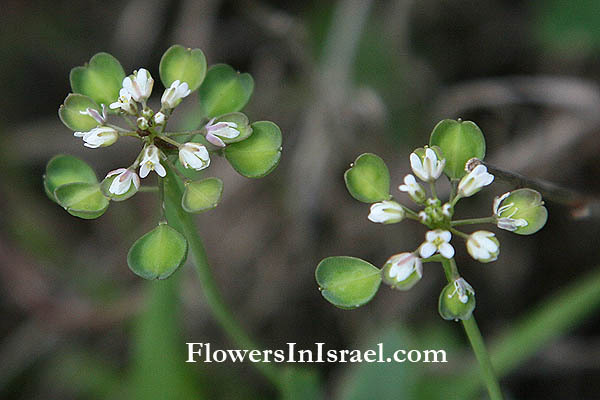 Thlaspi, Greek thlaein, to crush, from the flattened silicle; the Greek name for a cress. perfoliatum, perfoliate, leaves joined around stem. The standard author abbreviation F.K.Mey. is used to indicate Friedrich Karl Meyer (1926 -), a German botanist. 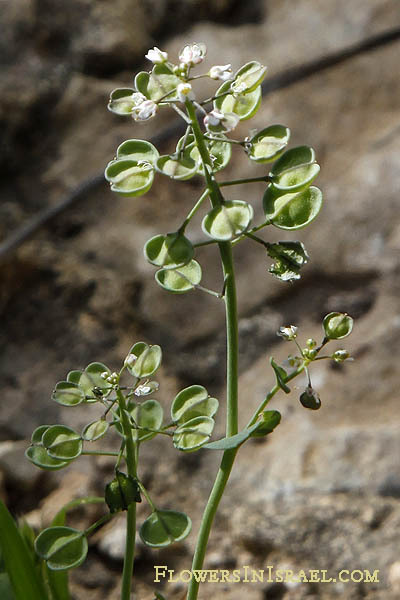 The fruits slightly resemble those of Capsella bursa-pastoris (L.) Medic. but the latter has fruits which are more triangular in shape and are smaller when mature. The leaves of both plants differ greatly from one another. Pliny the Elder (23-79 CE), Book XIX 171: The Athenian word for mustard is napy, those of other dialects thlaspi and lizard-herb. Book XXVII 139: Thlaspi is of two kinds. One has narrow leaves, a finger in breadth and lenght, turned towards the ground, and divided at the tip. 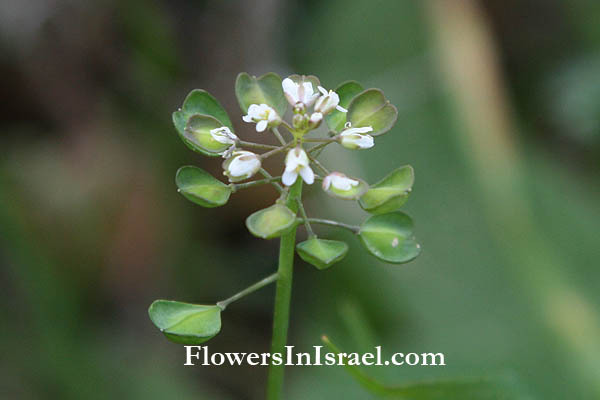 The stem is half a foot long, not without branches, and with seed enclosed in shield-like pods and shaped like a lentil, except that - hence comes the name- it is intented (see Dioscorides II 156). The blossom is white, and the plant grows in lanes and in hedges. The seed has a sharp taste and brings away bile and phlegm by both vomit and stools.